ES File Explorer has been one of the go-to options for file management on Android for many years. But with recent additions, including a Files app from Google itself, what reasons are there to choose this freemium product? As it turns out, ES File Explorer does much, much more than shuffle files around. Since it contains so many functions, let's start by installing the app, then get a 10,000-foot view of what it can do. You can install the basic version of the app for free in the standard way from the Play Store, or download an APK file directly from the developer ES App Group and sideload it. There's also a Premium version you can unlock with an in-app purchase. File Management: These are the functions to manage local files on your device. Your usual cut/copy/paste and folder creation types of things. Cloud Storage Management: You can also manage the files in your cloud accounts, including Google Drive, Dropbox, Box.net, OneDrive, and others. 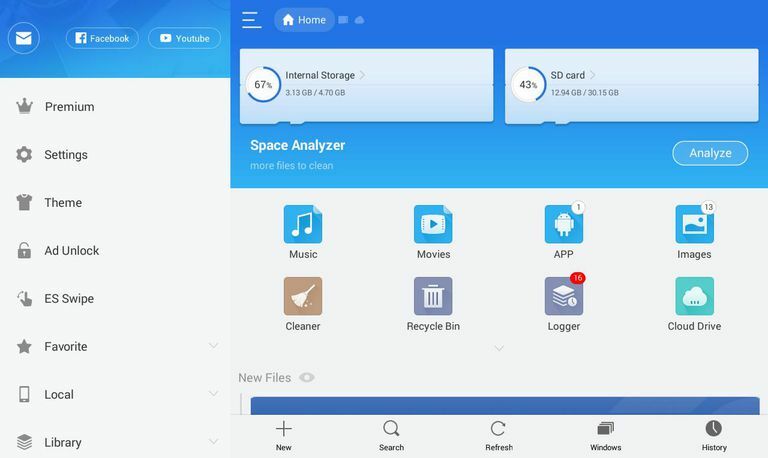 Storage Analysis/Optimization: One of ES File Explorer's main selling points is the features it provides to help you manage your device's precious space. It can show you where this storage is being used, and help you to keep things under control. Local Network Browser: Lets you connect to devices on your LAN, such as Windows machines and their shared folders. Tools: This category includes a handful of system utilities like a task manager and the ability to view the "root" system or other hidden files on your device. Also on-board are lightweight apps like a notepad and download manager. There are four elements to ES File Explorer that will appear at the top of the screen, regardless of what feature you're using. Main Menu: Found to the far left, this contains entries for all the functions you may want to use throughout the app, categorized into sub-menus. On a phone, it will slide out from the left with a tap, or a swipe along the left edge of the screen. On a tablet, it defaults to the open position, but you can close it with a tap as well. Windows: Each time you open a menu item or launch a tool, it will create a new Window, up to a max of 12. A Home screen icon will always remain on the left, then your Windows will be added directly to its right. Each icon represents the function used, such as an SD card for local files, a cloud icon for online accounts, etc. You can tap Windows to access a more readable list, which will show a screen, but bear in mind you can only have twelve windows open at a time. After that, they'll start to overwrite each other. Search: Second from the right at the top of the screen. Tap this to reveal a field to enter a keyword. The search function will look for your term in the names of files in your SD card. It also gives you the option to take an additional step and search outside this path. Overflow menu: Found at far right, this contains entries like New (to create a new file in the current folder), Refresh (reload the current view) a Windows list, and a history of recent locations, such a local, cloud, or otherwise. While Windows and History seem similar, they represent different things. Suppose you open one Window of your local storage, then go into a folder. You'll still have only one Window open, but your History will show two entries. The file management functions of ES File Explorer provide all the standard actions you'll need to keep your device's content organized. Tap the Local icon from the top menu to access this; which looks like an SD card. It's also available from the main menu; select the button at the top-left of the screen, then select Local, represented by a phone icon. Home: The screen, as denoted by the house icon. Home: The location on your SD card, usually "/sdcard/emulated/0." Device: Will take you to the root directory of the phone. Download: Usually located at "/sdcard/emulated/0/Downloads." Internal Storage: Also takes you to "/sdcard/emulated/0." When browsing the file system, you navigate the same way you would using a file manager on a desktop system. Tap a folder to descend into it, and tap a file to launch it. Just below the top menu bar is a breadcrumb trail which shows you the hierarchy you've traversed to reach the current folder. Use this to retreat up from your current folder. In order to start moving files around, long-press on a file or folder to enter selection mode, signified by check marks on all files and folders. The one you selected should already be marked, and you can tap the check box to select others. You're then able to Cut, Copy, and Paste, as you'd expect with a desktop file manager. Tap More to reveal other functions, such as sharing, compressing the selected items to a .ZIP file, and encrypting. A different way of managing and browsing your files is using the Library, which contains entries including Images, Music, and APP (which lists installed applications). It allows you to view all the things on your system by file type, rather than where they're located. While they're part of the app's local file management tools in a sense, ES File Explorer's analysis and monitoring tools warrant some further description. Analyze All: Will display by file category, e.g. Image, Music, Documents, etc. It will display the percentage of your storage used by recently created files, duplicate files, and large files. Analyze [Category]: A drill-down of the above to one specific file category. These reports exist for Photos, Music, Video, Documents, and Apps. Internal Storage Analyze: You can also filter the results by storage media, either your device's internal storage, or an external memory card. Like the files on your device, ES File Explorer also lets you manage your cloud storage accounts. Tap the cloud icon in the History bar (if one is there), or tap Main Menu > Network > Cloud Drive. You'll be prompted to add your first cloud account. ES File Explorer supports all the usual suspects such as Google Drive, One Drive, Box.net, and Dropbox. Select one, enter your credentials, and grant it access. You should be browsing your files in no time. The Cloud Drive screen shows folder icons representing all your cloud services. Tap the + to add additional ones. The great thing about ES File Explorer is that it can manage all your cloud storage, allowing you to do things like copy or move files directly from one service to another. In addition to cloud services, ES File Explorer has many tools to let you interact with local network services. Network: This screen has collapsible lists of all the servers and other resources you've set up. LAN: Lets you connect to Windows file shares on your local network. Cloud Drive: As discussed above. FTP: Lets you connect to regular FTP, SFTP, FTPS, and WebDAV servers. Android TV: Will let you browse files on those devices, if you have them. Bluetooth: Browse or exchange files with other devices via Bluetooth. View on PC: Starts an FTP server on your device, so you can enter the URL into a desktop client and access your device's files. Net Manager: Lets you control Wi-Fi connections, or create a hotspot on your device. Sender: Lets you drop files to other devices running ES File Explorer that are running on the same network. As noted above, the majority of these will allow you to browse and manage your stuff using a familiar interface. Once you set up the appropriate accounts, you'll have your content from the Internet, local network, and local device storage right there at your fingertips. Once you've configured all your cloud and local network accounts, consider adding them to the Favorites menu for easy access. A long press on folders representing these accounts will include this option. All the file-related functionality above probably seems like a lot to squeeze into a humble file manager app, but ES File Explorer didn't stop there. Download Manager: Allows you to enter a URL and file name to begin downloading a file. Unlike the some other downloaders, ES File Explorer's allows you to pause and resume your downloads. Cache Cleaner: Delete cache files. Startup Manager: See what starts up at device boot. Requires rooting. Power Optimizer: Displays items to turn off to preserve battery. About Device: Summary of important system levels. File Explorer: Returns you to the main app. App Manager: Takes you to the main app's APP Library. SD Card Analyzer: Takes you to the main app's Analyze All report — this appears to be a bug. Volume: Shows the volume levels for various events like incoming calls. Space Analyzer: As explained above. A Music Player: You can't create custom playlists with it, but it plays in the background and provides pause/forward/back controls in the notification drawer. Cleaner: Looks for trash files, obsolete .APK files, ad content, and unnecessary downloads you can delete from your device. Note Editor: Allows you to create plain text notes using a moderately capable editor. Overall, ES File Explorer is quite capable as a management tool for both local and network files. It also has some useful features to help you easily tidy up your storage without having to go hunting down individual files through levels of directories. Its other utilities are nice to have, but arguably unnecessary, and definitely not as good as other standalone apps in the same category would be (e.g. ES File Explorer's Note Editor versus a proper text editor). However, you don't need to pay for any of these features, making the free version of the app a very, very useful tool to have. There's also a Premium version of the app, available via subscription for varying prices. So what do you get for the upgrade? Firstly, it will remove the ads, and you can use the app's themes, as well as some minor feature enhancements.